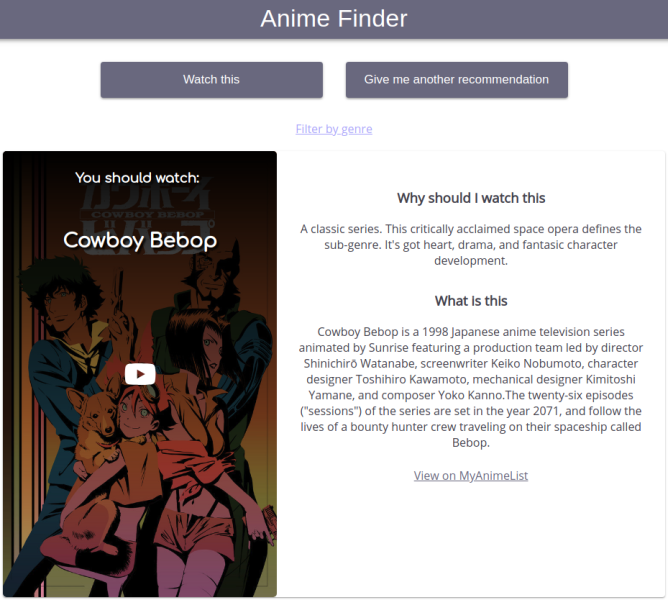 We built, Animefinder, a website which provides the user with a random Anime recommendation which they might like. It is a small collaboration with senpai Cory Harris. I don’t want to sound dramatic, but looking for an anime to watch is the biggest struggle in my life. Starting a new series is a serious emotional commitment. So for years, I found myself scouring Google for hours before I decided on one. A friend and I hacked together a small Anime Recommender for people like us. We wanted it to be as simple as possible. You just click and get a recommendation along with a reason why we think you should watch it. An array of object is used. This allows us have an iterable and use reduce and map methods. The objects can then be deconstructed and rendered. One method of creating recommendations is to pick a random index. Then using this index to display the recommendation. This works but in our use case, it’s not ideal to show the same recommendation. We would rather go through all the recommendations before repeating them again. That is, only show a recommendation once in a session. This can be accomplished by generating all the recommendations at the start of the session to guarantee that they won’t be shown twice. To do this, create an array of recommendation indices which are shuffled. What if we want to filter out some of the recommendations? We need to create a subset of recommendations without the ones we’ve filtered out. We will look at each recommendation object’s genre key, and keep one’s with values which don’t match the filter term. We looked at generating simple recommendations at random. With a well-curated dataset, we can create an illusion of personalized recommendations. This simple method of generating recommendations leaves a lot to be desired. To generate personalized recommendations we will need to venture data science and machine learning territory. Lets explore this further in the future.